1. Grind all the ingredients in A. 2. Heat up the oil in the wok on medium high heat. Put the above the ground ingredients A in. Keep stirring for about 10 minutes. 3. Add water, tomato paste, tamarind juice, salt, and sugar. Continue stirring for another 10 minutes. Add more salt or sugar to taste. Dish out and set aside. My good friends Farina and Michael came over to visit last week and we made some Malaysian-style BBQ seafood, inspired by this popular hawker fare in Kuala Lumpur (KL), Malaysia. They are called Portuguese-style baked seafood. There is really nothing Portuguese about it but Malaysia do have some Portuguese descendants because Malacca was a Portuguese colony in the 16th century. So perhaps this is how they bake their seafood—with fiery sambal, okras, and wrapped with aluminum foil. Farina and I enjoyed our BBQ so much. As Malaysians, we concluded that this is probably the best way to serve seafood BBQ-style. 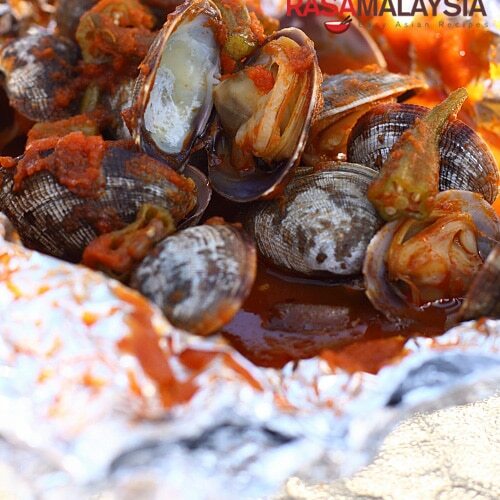 Our favorite is the BBQ clams with sambal and okras. It was simply lip smackingly delicious. To prepare these mouthwatering Malaysian-style BBQ, all you need are your favorite seafood and shellfish: shimp, squid, fish (we like stingray or white pomfret), clams, and some okras. Mix the seafood of your choice (you can also do a seafood combination) with sambal, okra, and wrap the aluminum foil tightly (preferably two layers to avoid leakage), and off onto the grill. That’s it. Try this new recipe this summer. You will not be disappointed! Grind all the ingredients in A. Heat up the oil in the wok on medium high heat. Put the above the ground ingredients A in. Keep stirring for about 10 minutes. Add water, tomato paste, tamarind juice, salt, and sugar. Continue stirring for another 10 minutes. Add more salt or sugar to taste. Dish out and set aside. Bottled sambal oelek is very spicy, but the above sambal recipe will "dilute" the spiciness. The recipe yields about two bottles or more sambal. You don't have to use up all the sambal for the BBQ seafood, just use enough for each seafood parcel. You can also try out my grilled fish sambal recipe here, which is more Nyonya-style. I love all your recipes–they are beautiful-flavorful and inspired! !Thank you for sharing. I love your blog too. I may make this one this weekend if I am not too lazy! That looks great. I would love to make this with clams. This reminds me of ikan bakar… :D I’ve never used sambal oelek to make the sambal dressing, will have to try this out soon. These pictures are amazing!! Really makes me wish I lived closer to a body of water so as to have access to some fresh seafood. I really like this way of cooking the seafood, sealing in the juices and adding enough punch with the fiery and tangy sambal. But not many places here can do them well. The Midvalley food court used to do a delicious version, but not anymore. Even the Petaling Street’s famous one was horrendous the last time I ate there. I can’t find this type of grilled seafood in Penang though. Love it that it seals in the juices. Slurp!!! I see myself licking the clam shells already…. Tiga – yes, very good, especially the clams. The clam juice mixed with the sambal is extra savory. My friend said we should have made rice to go with it. LOL. I am just wondering what kind of sambal you used. Did you get it here or you brought them over from Malaysia? Sambak Oelek, you can get them bottled at Asian stores. O, I am sorry! I mean the belachan. Not the sambal. Sorry! Oh yes. The good old sambal oelek! YUM. How long on the grill? there is nothing about the seafood & okra. how much? how long on the grill? can you cook all the different kinds of seafood together — don’t they cook at different rates? I didn’t weight everything, not when it was a fun BBQ. Measuring everything precisely took the fun out of it. We grill each packet of seafood differently. Did you have to turn the fish over on the grill? Am planning to try grilling in the oven as I don’t have a grilling pan or a bbq. I loooove Malaysian Portuguese style seafood. Can’t wait to try this! Yes, on the grill but oven should be fine. My neighbour will either love me or hate me if I BBQ this in my backyard in Sussex ! Beautiful & yummy dishes. Thanks so much for inspiring me to cook again. Stopped cooking when the babies came along & I was caught up with the rat-race in Spore. During my recent retirement, I’m exploring my passion ie Cooking once more.